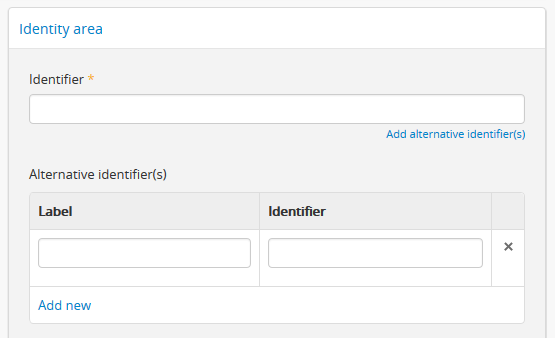 In the Identifier field, you can automatically generate an identifier if desired, based on the settings defined in Admin > Settings - for more information, see: Identifier mask. 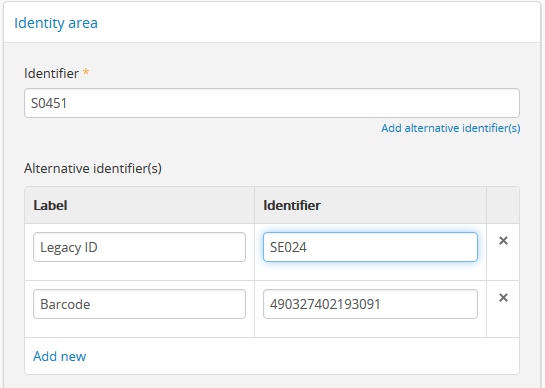 Click the “Generate identifier” link beneath the identifier field, and AtoM will populate the field with a unique value based on the identifier mask settings. 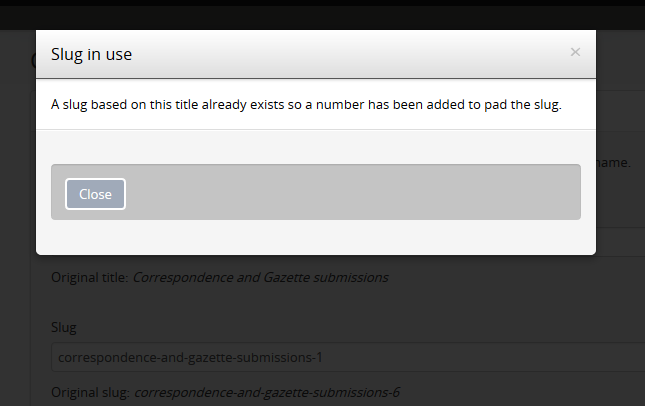 Clicking this while the identifier field is populated will overwrite any existing data - if you do this by accident, you can always click “Cancel” in the button block at the bottom of the archival description edit page. One populated, you can still edit the supplied value - place your cursor in the identiier field and make any desired changes. You can add as many levels as needed at one time; for example, to add multiple series to a fonds or collection, fill in the fields under the “Add new child levels” and add as many lower levels as desired. When the record is saved, you will be able to see the new child records in the context menu. You can navigate to it later to supplement it with further information - see: Edit an existing archival description. Enter appropriate information into the template for the lower-level description, and remember to select the level of description. For more information on working with new descriptions, see the guidance in the section above, Add a new top level description. If you wish to edit the existing Identifier value and replace it with one generated by AtoM based on the Identifier mask settings, you can click the “Generate identifier” link beneath the identifier field. AtoM will overwrite the existing value, and populate the field with a unique value based on the identifier mask settings. To assist the description workflow when working with hierarchical descriptions, AtoM includes a “Calculate dates” task that can automatically update the controlled start and end date fields of a parent archival description’s event dates, based on the broadest values found in descendant descriptions. Users can update any event type (e.g. Creation and Accumulation in ISAD(G); or other event types such as Manufacturing, Collection, Broadcast, etc. found in other description templates), and in cases where there are multiple dates, the option to select the target date is provided. Additionally, for a non-destructive approach (or if users would like to compare the existing date range with a newly calculated one), it’s also possible to calculate a new date range without overwriting existing data. 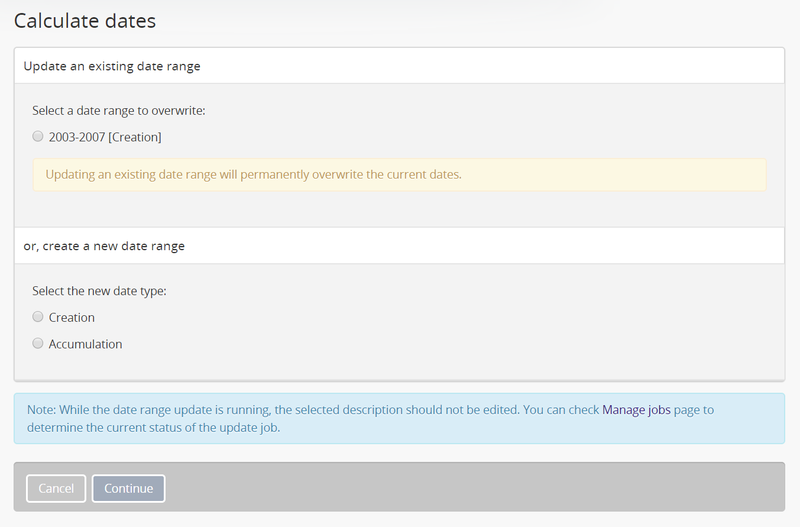 AtoM will only update the internal controlled start and end date fields, not the display date. The Display date field is a free-text field that allows the use of typography (as suggested by relevant standards or local practice) to indicate approximation and/or uncertainty. 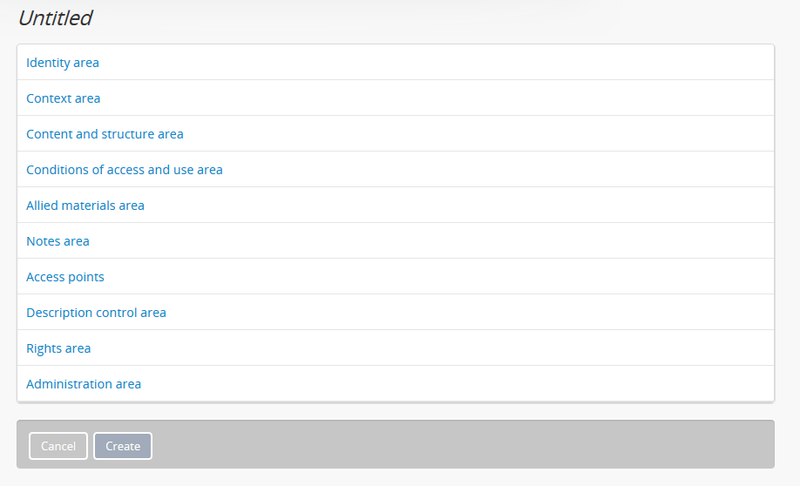 When a description is saved, the values in this field are what are shown in the view page of an archival description. The start and end date fields, which expect ISO 8601 date values (e.g. YYYY-MM-DD, YYYY-MM, or YYYY), are never shown to public users. These fields are used to support date range searching and sorting. Because the display date field is free-text and may contain important non-numerical contextual information, AtoM is not able to automatically update this field. This means if you use the Calculate dates task, it is important that you review the display date field of the updated date range after the task has completed, and make any further manual updates necessary. In this example, the “Interviews” series currently being viewed has a broader date range added to it than its parent collection, the J.A. Wainright - Robert Markle collection. Clicking the hyperlink on “higher levels” in the warning will redirect AtoM to the nearest parent record in need of an update. The option to launch the Calculate dates task appears in the right hand context menu (aka sidebar) of the archival description view page. If there are no lower-level descriptions with dates, the option will not be shown. Once the task has been run, AtoM will display the date and time of the most recent task execution. This date value is derived in part from the PHP timezone settings, which a system administrator can configure in one of AtoM’s configuration files. For more information, see the Administrator manual: Manage AtoM configuration files. First, navigate to the archival description whose dates you would like to update. You can do this by browsing or searching for the archival description - see Access content for more information on navigation in AtoM. In the right-hand context menu under the Tasks section, click the “Calculate dates” link. The top section of the page will display a list of existing dates on the current record - the event type (e.g. creation, accumulation, etc.) will be shown in square brackets following the date range value. If you wish to update the start and end date values of an existing date range, select the target date range using the radio button next to the appropriate date. Alternatively, you can also choose to create a new date range. AtoM will present date event types based on those present in the lower levels of description - if your lower level descriptions only have creation dates, then you will only see “Creation” as an option here. When you have configured your choice, click the “Continue” button in the button block at the bottom of the configuration page. This will launch the task. While the date range update is running, the selected description should not be edited. The task is handled by AtoM’s job scheduler. You can navigate to Manage > Jobs to check on the status of the job. 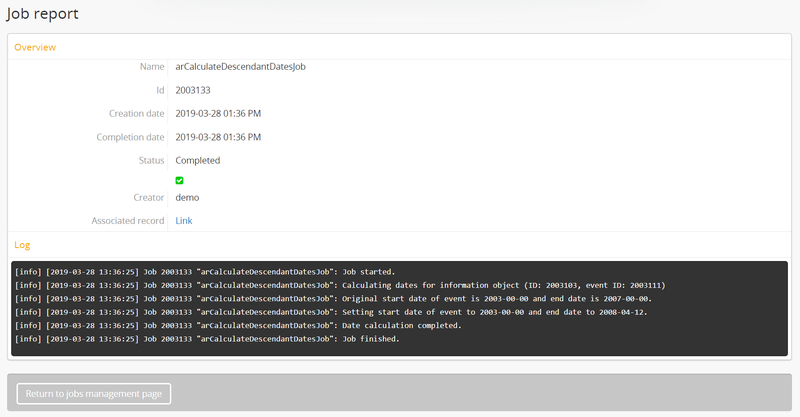 The Job details page’s console output will also display what the original start and end date values were, and what they have been updated to after the task completes. For more information on Jobs in AtoM, see: Manage jobs. Remember, AtoM will only update the start and end date fields for the target date, not the display date visible on the view page of the description. This is because the the display date field is a free-text field and may contain important non-numerical contextual information (such as typographical marks to express approximation or uncertainty, etc), and as such AtoM is not able to automatically update this field. This means if you use the Calculate dates task, it is important that you review the display date field visible on the view page of the description after the task has completed, and make any further manual updates necessary. See above for more information on editing descriptions in AtoM: Edit an existing archival description. You can repeat this process as many times as needed, or again at higher levels if desired. When editing a slug in AtoM, it is important to understand how they are generated, and why your slug may be saved differently than the value you input. Slugs in AtoM are sanitized to remove spaces, special characters (such as ! @ # $ % & etc), and capitalization. They are also truncated to a maximum of 250 characters. Since they are used as permalinks, they must also be unique within the system - so AtoM will automatically append a dash and an incrementing number to the end of non-unique slugs. More information on slugs in AtoM can be found here: Notes on slugs in AtoM. 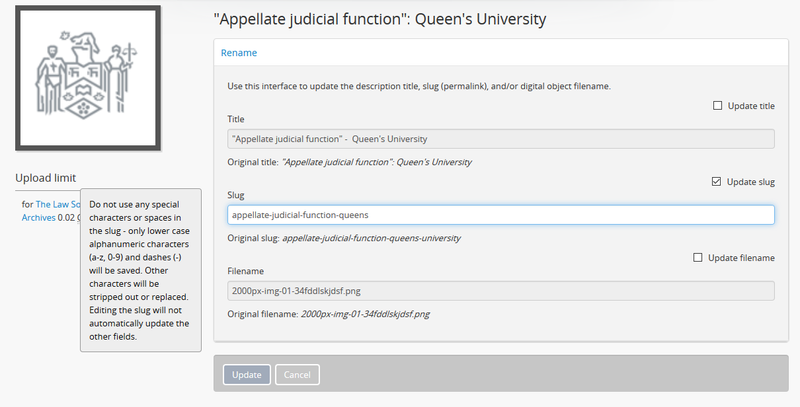 Whenever the Rename module alters the slug you enter based on the above parameters, a notification indicating this will be shown. 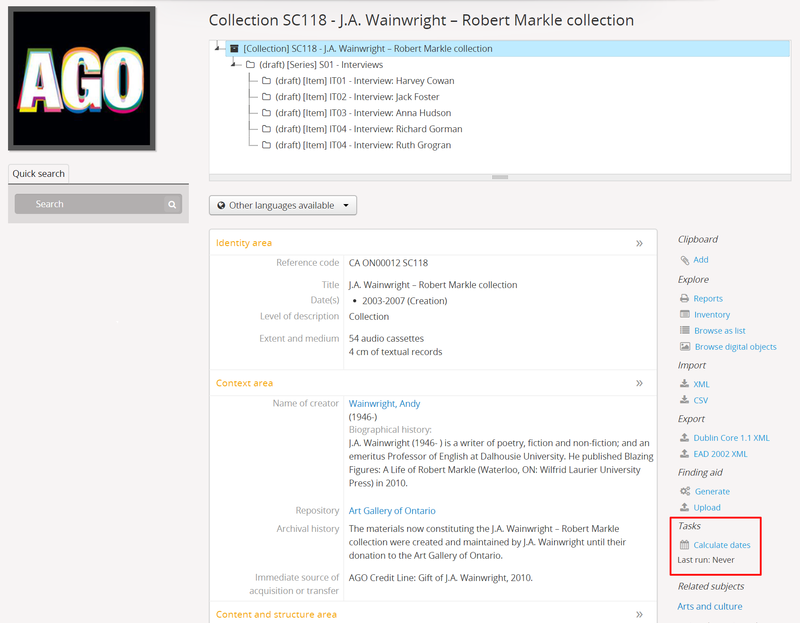 Although it can be done in the same module, specific instructions on editing the filename of a linked digital object will be covered on the Upload and manage digital objects page - for more information, see: Edit the filename of a digital object linked to an archival description. 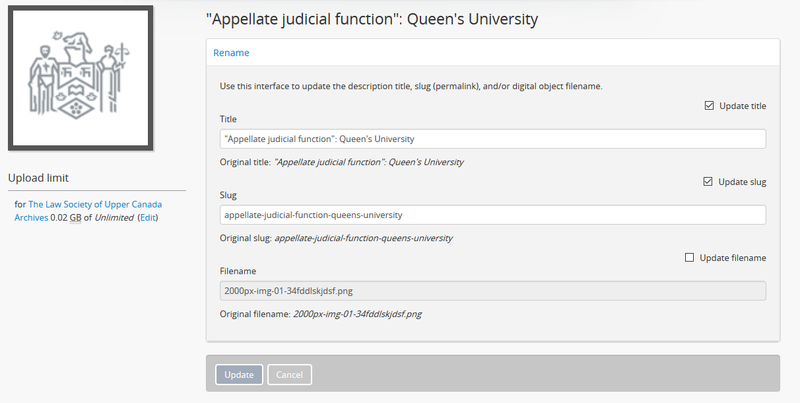 For more information on editing the digital object filename with the rename module, see: Edit the filename of a digital object linked to an archival description. AtoM has a basic audit log for archival descriptions that can be enabled by an administrator in Admin > Settings > Global - see: Enable description change logging. Once enabled, AtoM will capture basic information (including date, type, associated user, and/or associated description) when archival descriptions are created or modified. 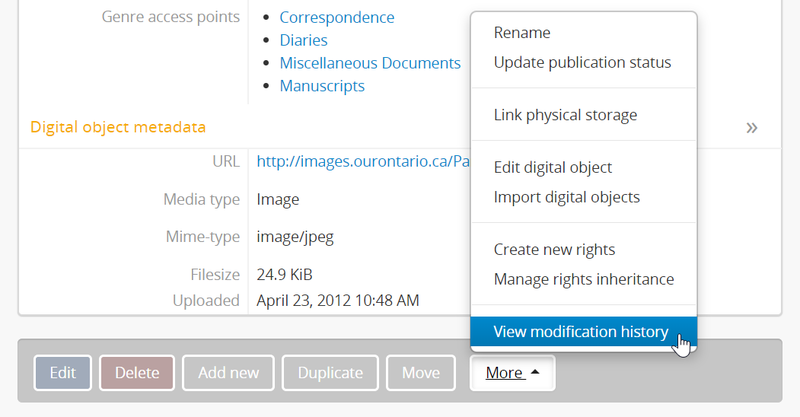 For archival description modifications to be tracked by AtoM, an administrator must first have enabled the Enable description change logging setting. Any description creation or modification events prior to enabling the setting will not be tracked. Navigate to the view page of the archival description whose audit log you would like to see. You can do this by browsing or searching for the archival description - see Access content for more information on navigation in AtoM. If the “View modification history” option is not present in the More menu, this is likely because the audit log has not been enabled by an administrator. See: Enable description change logging. Date: Includes the date and time the change was made. The date and time values are determined based on the PHP time zone settings, which can be modified by a system administrator in the apps/qubit/config/settings.yml configuration file. For more information, see: Manage AtoM configuration files. Type: Either Creation, or Modification. 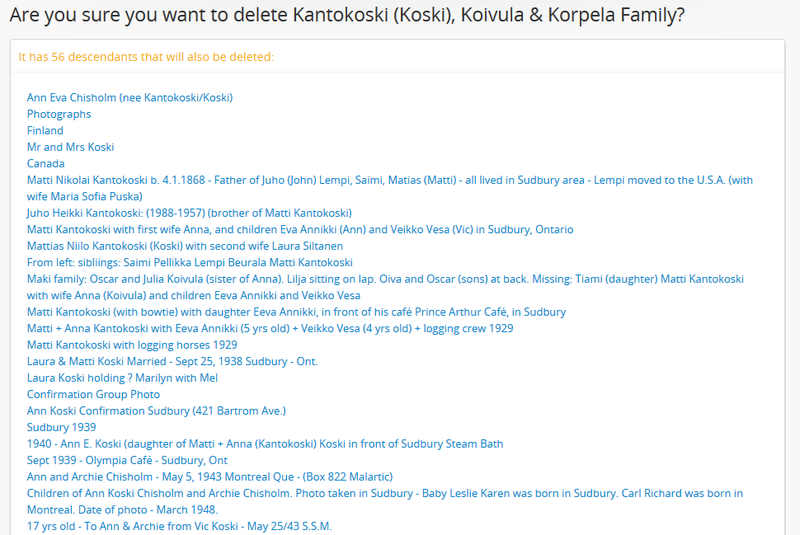 Deletions and other events are not currently tracked. User: The username of the user associated with the modification. Note that for administrators, these usernames will appear as hyperlinks - an administrator can click the hyperlink to navigate to the related user’s profile page, where a full history of that user’s desrciption modifications can be seen. 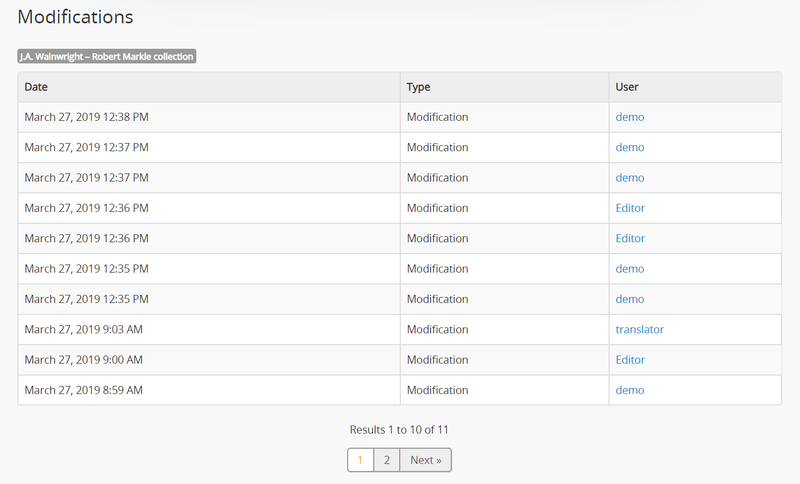 For more information, see: View a user’s description modification history. For records created or modified via actions performed via the command-line interface (such as a CSV import, etc), no associated username will be shown. In the image above, the record was created via a command-line EAD XML import - as such, the User field for the associated modification is empty. The number of results included in the Modifications page is determined by the Results per page setting in Admin > Settings > Global. If there are more results than the results per page setting, AtoM will display a pager at the bottom of the page, to allow you to page through the results. This ability works with both treeview types (full-width and sidebar). However, to be able to change the sort order with the sidebar treeview, an administrator must change the “Sort treeview” settings (located in Admin > Settings > Treeview) to “Manual”. Otherwise the drag and drop capabilities of the sidebar treeview are disabled. In the treeview (depending on your settings located either on the left- hand side or above the record’s view page), the current record being displayed in the view page will be highlighted. For more information on the treeview, see: Treeview. In the Sidebar treeview, if the “Sort treeview” setting has been set to “Manual” by an administrator in Admin > Settings > Global > Sort treeview, then you will see three horizontal lines or bars appear on the right-hand side of the record-title you are hovering over in the treeview. This means the item can be dragged and dropped to a new sort order. The record in the treeview will drop into its new location. For the sidebar treeview, no changes will occur on the view page of the current record, though the sort order has been changed within the collection. You can repeat these steps as many times as are necessary to achieve the sort order you wish. For the full-width treeview, a Move job will be triggered, and a notification will appear. You can continue to drag nodes as needed, but the page will not be automatically updated until you manually refresh your browser page. To find your move location more quickly you can use the Move search bar to bring up results in the Move browse results listed below. 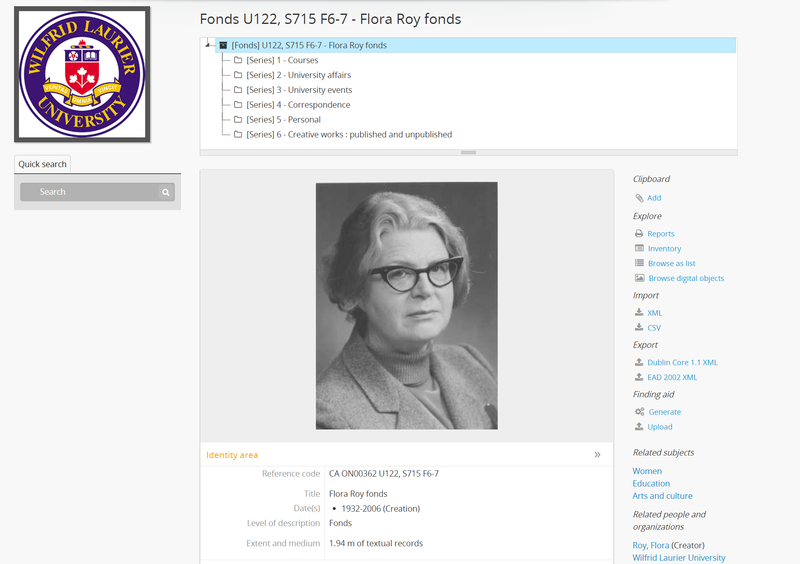 For example, if you don’t know the name of a series record but you do know the name of the fonds or collection, you could search for the top-level description and then use the Move browser (below) to navigate to the correct level of description. 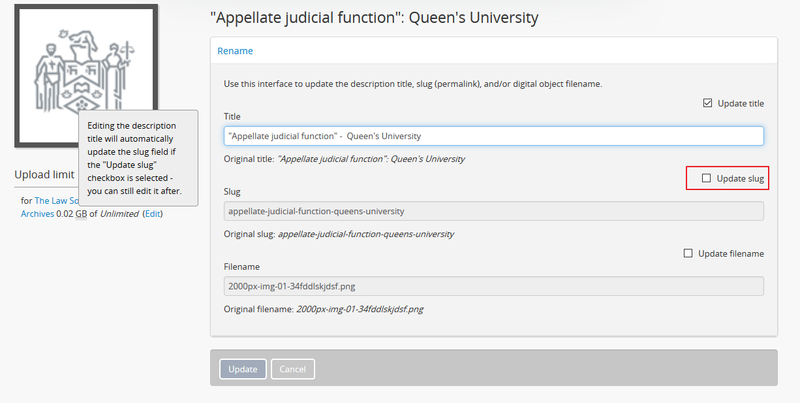 The blue hyperlinks allow Users to drill down into the hierarchy of the archival description selected. Clicking on a top-level description in the Move page will display the description’s lower levels of description - for example, clicking on a fonds would reveal the series below it, and clicking on the series would then reveal the files below the series. To orient yourself, a breadcrumb trail will appear above the list of potential archival descriptions, indicating where in the archival unit’s you are currently located - this is intented to help Users understand if they are moving the record to a subfonds, series, sub-series, or a file. If there are no more lower-level descriptions beneath the current level you are exploring in the move browser, then the move browser will be empty, as you can no longer drill down any lower in the hierarchy. 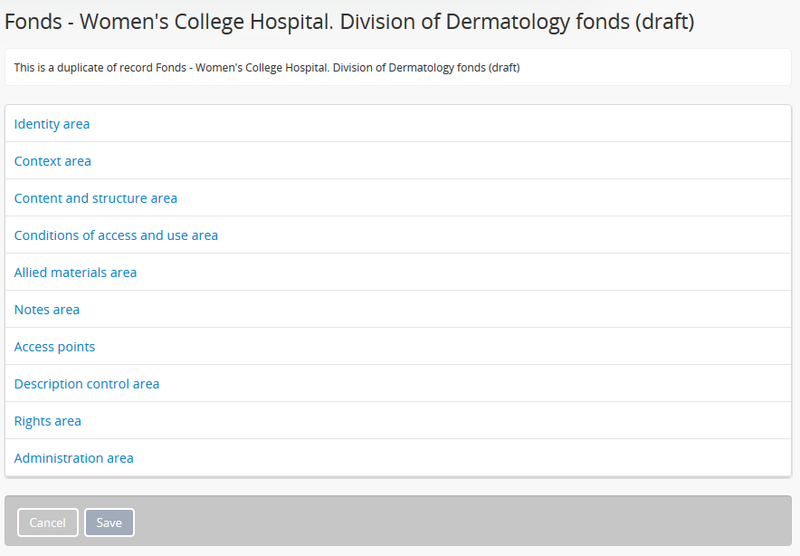 You can always use the breadcrumb trail above the move browser to navigate back up the current archival hierarchy, or use the search box to begin a new search and browse for the correct move location. When you have reached the right level where you want to move the record, the new parent description should be the last breadcrumb in the breadcrumb trail, while the new siblings (if any) will be listed as hyperlinks below. Click “Move here” in the button block to move the record. After clicking the Move button, the page will reload with a notification at the top of the page informing you that the Move operation has been initiated by the job scheduler. There is a link in the notification that will take you to the Manage jobs page if you want to check on the status of the move operation. On the Jobs page, if the job has been successfully completed, then a link to the record’s new location will appear as a blue arrow in the Job status column. Additionally, if you click the “Full report” link, you will be taken to the Job details page, where you can see the console output of the move job. There will also be a link to the associated description provided there.